Tom Petty | The Last DJ | Warner Bros.
Father to dozens of car-radio classics, Tom Petty in his later years has sidestepped his sing-along wizardry for a more somber, introspective feel. As if equating maturity with acoustic guitars and whispered vocals, Petty captured a dynamic, autumnal grace with 1994's Wallflowers but has since traversed shaky terrain. He can't fully give up his reckless, charming youthfulness, but he's not deep enough for meaningful artistic statements. In the process, he's become just one more slightly boring middle-aged rocker. His uptempo stompers now have stretch marks, while he pours orchestra upon orchestra into his tender ballads, which classic-rock stations aren't gonna play anyway. That over-the-hill stench gets a little more pungent with The Last DJ, Petty's kinda/sorta concept album about the evils of the music industry. Still, when he's not trying to satirize the biz -- where his targets are obvious and caricaturish -- he falls back on his considerable songwriting strengths. It should be no surprise that the old dog defeats the new tricks by a wide margin. Editor's Note: They screwed up Mike Campbell's name and I find it very amusing. Tom Petty and the Heartbreakers performed in their hometown to celebrate mediocrity with an audience Petty referred to, and what actually felt like, friends. At the Forum in Inglewood on Nov. 23, Tom Petty and the Heartbreakers took to stage to play new music from their latest album, "The Last DJ," and to reach deep into their catalog for classic tunes, "Hope you don't have to get home soon. We'll travel," Petty forewarned. If you're wondering how six middle-aged musicians - two balding, one paunchy, and their leader showing jowls - could whip an arena full of people into a rafter-shaking frenzy 'round about 11 on a school night, just watch Tom Petty and the Heartbreakers blaze a vapor trail through the ending of "Runnin' Down a Dream" sometime. Petty's highway jam put a fevered exclamation point on the band's regular set Tuesday at a nearly sold-out First Union Spectrum, and set the stage for a dizzying encore of "You Wreck Me," Chuck Berry's "Carol," and a spry "American Girl." In attempting to weave the corporate-tainting-of-America concept of his new album, The Last DJ, into the 23-song set - while playing the staples and the occasional deep cut, such as the 1979 gem "Shadow of a Doubt (A Complex Kid)" - Petty and his crack Heartbreakers took some time getting their feet underneath them. Tom Petty's new CD "The Last DJ" (Warner Bros.) isn't the best record of his renowned career. Nor is it his most lyrically compelling, given its penchant for viewing the past through the rose-colored monocle of middle-age nostalgia. However, "The Last DJ" does serve up a handful of Petty's catchiest songs ("Dreamville," "The Last DJ"), and it provides a rare example of a major label artist ripping the music biz for giving consumers too few choices and ignoring all but the fattest cash cow artists. Others share Petty's concerns, but few have voiced them so unambiguously in their music. The Last DJ is Tom Petty's latest stab at exposing the less savory aspects of the recording industry and trying to force it to mend its ways. With every other musician in the business stepping up to take a crack at the topic, Tom's complaints are, by now, pretty familiar: CDs cost too much; record labels only care about the bottom line and will use any excuse not to pay artists; concerts are less about music these days than about beer, T-shirts, and hyper-inflated prices; and, worst of all, music today is mediocre and sterile. Basically, asserts Petty, the industry has driven the life out of music by fostering a flavor-of-the-week mentality that makes it virtually impossible for any act to make an impact beyond first-album hype, since by the time that hype has passed, the record label has already given up and moved on to the next hopefully big thing. Such complaints have been echoed by everyone from Aimee Mann to Steve Albini, Courtney Love to Don Henley. And Petty, too, feels something should be done about it. It's a role he's performed before. Twenty-one years ago, when a fresh-faced Petty found himself one of MCA's biggest stars, the label tried to bump his fourth album up to a premium $9.98 price. Petty fought back by threatening to name the album $8.98; MCA relented. Good for him. But his latest approach to the matter is problematic: While questioning the wisdom of having virtually every radio station in the country under the control of one master playlist, he manages to insult a lot people he should be trying to win as allies. By referring to people who "celebrate mediocrity," he immediately throws up a wall between those who have taste and those who don't, and you can bet your amp which side Petty believes he's on. Petty's never made it any secret that he doesn't much care for some of the new music that's come down the pike since he was at his commercial peak, and there's a certain lovable-curmudgeon quality about him that somehow makes his anti-urban-music stance somewhat tolerable. Tom Petty--perhaps the skinniest and surely the blondest man in rock--sees the world in simple, black-and-white terms. He is the antithesis of the "complex kid" who eludes him in "Shadow of a Doubt," which he performed Wednesday at the United Center. 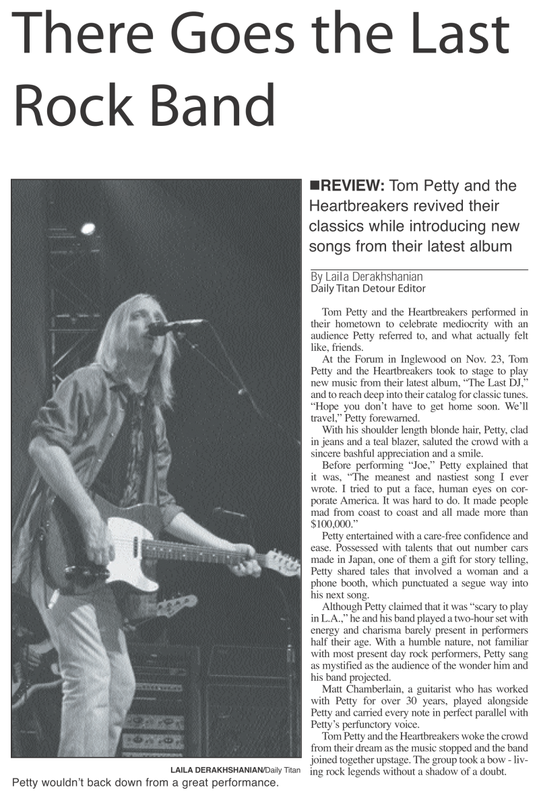 Petty and his longtime band, the Heartbreakers, demonstrated an immunity to trends, both musical and cultural. They are content to play '60s folk-rock, laden with Byrds and Beatles references and dosed with touches of garage mania and psychedelia. Petty remains a hold-out against corporate sponsorship, as he reminded the audience, and his latest album, "The Last DJ," is an attack on the multinationals that control the music and radio industries. Ironically, the concert was co-promoted by no less than two local radio stations. Snippets from his songs found him filling the boots of the defiant loner: "You don't know how it feels to be me"; "I won't back down"; "There'll be more like me who won't give in." He exudes a kind of outlaw integrity, even as he equates "Mr. Businessman" with Pontius Pilate in "Can't Stop the Sun," laments how "we celebrate mediocrity" in the title song from his new album, and complains that the "main energy in America is greed." It may not be a fashionable persona circa 2002, but Tom Petty has always been a hippie idealist, even if his music eschews the most popular '60s cliches (hello, Dave Matthews and all of you jam bands) in favor much simpler, cleaner and janglier sounds. 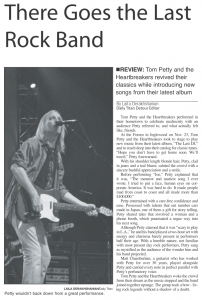 Musically, Petty and his longtime backing band, the Heartbreakers, rarely offer any significant surprises in concert. Their solid two-hour set Wednesday night at a packed United Center was much like their last three or four visits to Chicago: simple, clean and jangly as ever, full of heartfelt tunes about standing your ground and not backing down, but with the added edge of Petty having declared war on the music business as usual. The laconic blond rocker opened his set with "The Last DJ," the title track of his recent album, and a withering critique of the soulless nature of corporate rock radio that has won him the wrath of the National Association of Broadcasters and many radio programmers. Further on, he delivered several strong attacks on the major label system and corporate sponsorship of rock bands. Crankiness brings out the best in some people - Tom Petty among them. At his Madison Square Garden show with The Heartbreakers Friday, Petty featured material from his new album "The Last DJ," which carps about the sorry state of pop music with the fed-up candor of a classic old coot. "There goes the last human voice," sang Petty woefully in his opening number, which serves as the CD's title track. Yet, for the next two hours and 15 minutes, Petty and his band played with a joy and finesse that completely overrode his budding role as codger. In fact, Petty's critique of what he sees as the greed and shallowness of current pop seems to have revitalized him. While his shows in the last decade could often amble and mosey, this one crackled and stomped. It was the most animated Heartbreakers' show I've seen in 20 years. Let's start with the bad news: it seems Tom Petty has fallen in love. It gets worse. The object of Mr. Petty's affection isn't a woman, or a drug. It's an ideology. His new album, "The Last D.J." (Warner Brothers), is dedicated to the rather banal proposition that rock 'n' roll is good and big business is bad. His concert at Madison Square Garden on Friday started with the album's title track, an easygoing rock song with lyrics attacking radio stations that "celebrate mediocrity." When he announced, "This song's about living in corporate America," that meant it was time for a ludicrous bit of protest-pop called "Can't Stop the Sun." Mr. Petty dropped to a murmur to sing about how "There'll be more just like me who won't give in, who'll rise again." (Did he borrow the words, along with the quiet delivery, from a Steven Seagal movie?) Then the guitars hit, loud and blissful, as Mr. Petty crooned, "Can't stop the world from turning round and round and round."